Who's That on the $50 Bill? Placing Joseph Smith in America's story. Joseph Smith, Jr., is suddenly everywhere. Two centuries after his birth in 1805, the first prophet of the Mormon faith is experiencing a renaissance of national publicity. The anniversary year just ending represented not only an opportunity for believers to resuscitate the scholarly respectability of their leader but also an economic boon for those who profit from the growing public thirst for things Mormon. Major university presses such as Oxford and Columbia published significant works in Mormon Studies, and venues from Claremont Graduate School on the West Coast to the Library of Congress in Washington, D.C., sponsored academic conferences highlighting the contributions of Smith's legacy to American history and the study of religion. Now Richard Lyman Bushman, a respected American historian and a believing member of The Church of Jesus Christ of Latter-day Saints, has produced what must surely be regarded as the crowning achievement of this year of celebration and reflection: an exhaustively researched and beautifully written biography of Mormonism's enigmatic founder. Bushman, equally at home within the university and the Mormon tabernacle, has three essential goals in this work. First, he seeks to explore faithfully the story of Joseph Smith's life. 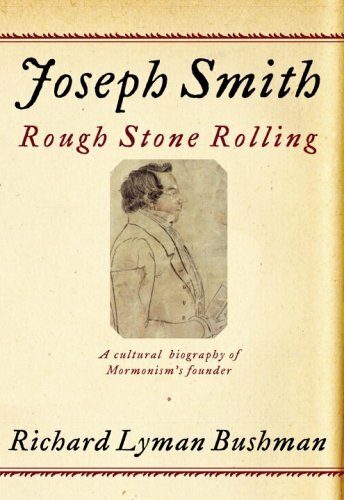 He attempts, in his words, "to think as Smith thought" in an effort to explain his actions and the development of the Mormon movement between 1820 and 1844. Second, Bushman strives to present an apologia to a secular (and most often hostile) world. Thus, he labors to convey the reasonableness, coherence, and historicity of Smith's doctrinal world. Finally, Bushman wants to legitimate Smith's importance beyond the Mormon world by situating him within a pantheon of American icons, as well as within broader intellectual currents of Western civilization. Bushman wants to make Joseph Smith more than Mormon.